Escape on board Whitsunday Getaway to enjoy the Whitsundays the luxurious way. Enjoy a tropical getaway, complete with comfort, style and class and an itinerary that is both flexible and action-packed. Lounge on board Whitsunday Getaway's spacious desks, sailing amongst the picturesque tropical islands of the Whitsundays. You can also snorkel, swim or sit back and relax - this trip has it all. You can watch the sunset on board with glass of champagne in hand and fall asleep to the soft lull of the ocean, only to wake up to unbeatable views of this tropical paradise. Check out the video below to see what a Whitsunday Getaway looks like! Whitsunday Getaway has four spacious cabins, all with queen-sized beds and private ensuites. 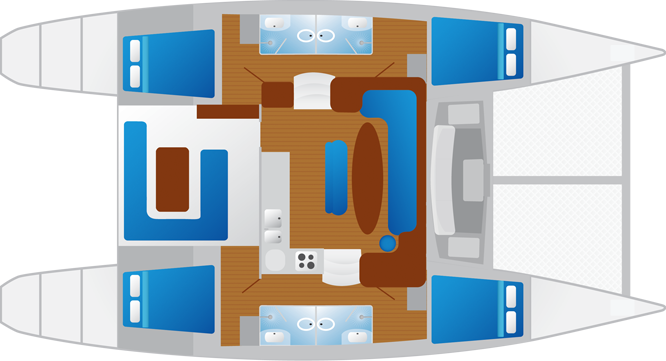 Tap the hotspots on the floor plan below to view Whitsunday Getaway 2. Whitsunday Getaway stands above the rest with its exclusive design, low guest numbers and quality service. The flexible itinerary allows passengers to see all the best of the Whitsundays, where keen sailors can take the helm, enthusiastic snorkellers can spend plenty of time in the warm tropical waters, and those wanting rest and relaxation can sit back and enjoy the Whitsundays weather! You will also get to visit Whitehaven Beach and Hill Inlet to enjoy unbeatable views, as well as taking plenty of time to relax on the sunny, beautiful beaches of the Whitsunday Islands. After your full day, you can ask your crew to drop you off at a tropical beach, like Bali Hai, to watch the sun set over a bottle of wine and a delicious freshly prepared antipasto platter. Spend time enjoying an authentic sailing experience, complete with sails up and wind in your hair, as you revel int the beauty of your surroundings. Whitsunday Getaway will spend its evenings at peaceful, protected anchorages like Nara Inlet off Hook Island, allowing for a relaxing night's sleep on the calm ocean, where you can wake up to beautiful sunrises and unforgettable views. 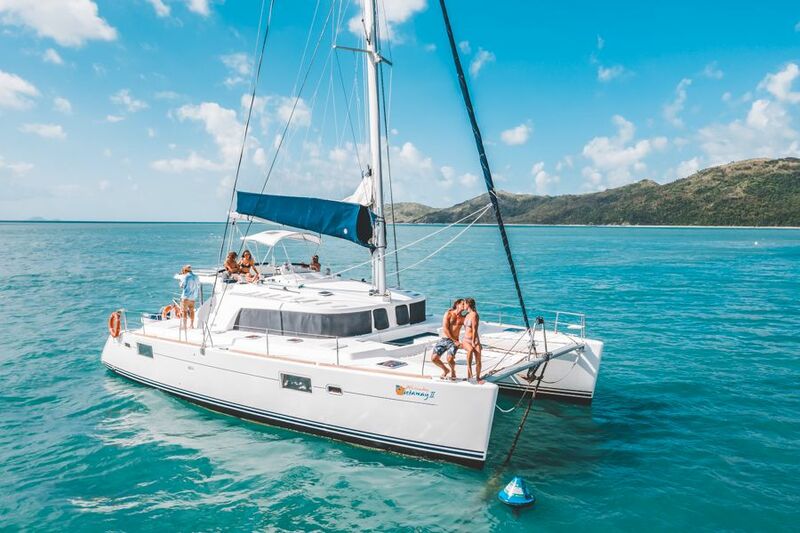 Whitsunday Getaway is owned by local couple Rich and Veronica, who care a lot about their vessel and the type of experience they provide and aim to make each and every trip and unforgettable one. After all of your in-water excitement, Whitsunday Getaway will whisk you off towards the iconic Whitehaven Beach, where you can spend as long as you like sunbathing on the pure white silica sand, and exploring in the shallow warm waters. You can join the crew for a short bushwalk up to Hill Inlet Lookout, where you can see the world-famous views overlooking the 7km stretch of Whitehaven Beach and Hill Inlet below. The swirling sands are one of the most photographed places in all of Australia and with good reason - they are never the same twice offering a new point of view visit after visit! 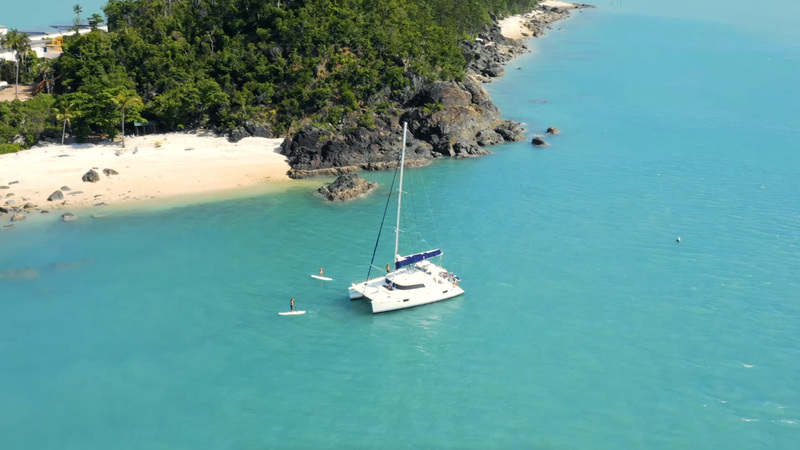 What better way to explore the Whitsunday Islands than with the sails up on board an luxury catamaran! We keep sailing at the top of the agenda on board Whitsunday Getaway, always allowing our guests to have to amazing experience of a sail-powered trip. You can sit back and relax as the crew takes you around the Whitsundays or you can take part in the fun and help hoist sails or man the helm - the crew are always happy to get you involved if you would like! Sails up, engines off, the sound of the waves crashing at the bow... this is the sound of luxury! The Whitsunday Islands are an important part of the Great Barrier Reef and its vast and diverse ecosystem. The fringing reefs of the islands are a snorkeller's paradise, where you will find amazing marine life, nestled away in calm coves and protected bays. Whitsunday Getaway carries a full complement of snorkel gear aboard including stinger suits, fins, mask and flotation assistance devices, so all guests can enjoy an unforgettable snorkelling experience. Snorkel with schools of tropical fish, and be amazed by the bright and vivid colours of the spectacular coral formations. The warm waters and calm seas of the Whitsundays are ideal for snorkelling year round, with an average water temperature of 25 degrees. Paddleboards allow for a great view of the surrounding area, and are a fun way to explore the reef and coastline! Keep on enjoying the sun as you glide on the surface of the reefs, having fun keeping your balance and paddling around. From above the water you will get to enjoy the reef in a new way as you quietly make your way around as fish and other marine life hang out below. Great for spotting turtles, stand-up paddle boards are becoming popular all over the world. You will be impressed with our delicious menu on board Whitsunday Getaway, where all meals are freshly prepared using locally bought produce. Fresh fruit and cookies are included throughout the trip, and a range of soft drinks and bottled water are available for purchase. All dietary requirements are catered for from vegetarian to gluten free but please advise us ahead of time so we can cater for your needs. We are happy to help you celebrate any special occasions such as birthdays, engagements and anniversaries. Please let us know when booking your trip so we can do something extra. Whitsunday Getaway does not sell alcohol, but guests are welcome to bring their own alcohol beforehand as we have cold storage on board. Bottled wine is fine, however we request that beer is in cans not bottles for safety reasons. We have included below a sample menu. Please note it may vary due to the availability and seasonal availability of some fruits and local produce. Whitsunday Getaway is also available for Private Charter. Please bring only a small soft bag with: change of clothes, hat, swim-wear, sunscreen 30+, warm pullover for the evenings (seasonal). You will also need to bring your own alcoholic beverages, available for purchase in town. No glass bottles please. BYO alcohol - no glass bottles, with the exception of wine and Champagne. Soft drinks available for purchase on board. An $18 surcharge may apply for some dietary requests and requirements. All client cancellations forfeit up to 25% of total ticket price and all client cancellations made less than 30 days prior to departure will result in complete forfeiture of the full price of the sailing holiday. If the sailing company has to cancel the trip (prior to the boat's departure) and we cannot offer a suitable alternative, then a refund will be given minus card fees. We strongly recommend that you have travel insurance, especially during the wet season. "I had an amazing time on our 3 day 3 night sailing trip. everything from the boat to the food to the crew was exceptional, exceeding my expectations. Nina and Chris were a wonderful team. Just got off the boat and I wish we had another 3 days to go. I'll definitely be back to airlie and would love to book again woth whitsundays getaway." "We had a brilliant time on the 3 night cruise with our skipper Phil and host Deb, on the catamaran Getaway2. The experience exceeded our expectations with a comfortable cabin and washroom, great food served up by Deb and Phil and the superb scenery and locations. We were really lucky to have great company too and all eight of us had a really wonderful time. Phil was a perfect skipper, knowledgeable about where to go and what to see and always keeping an eye on us all. He was also laid back and relaxed and he and Deb were a real pleasure to chat to "Up Top" as we sailed around the Whitsundays. Truly the highlight of our 4 week Australian adventure and couldn't recommend it enough to anyone considering this type of trip." "We loved the laid back feeling on this trip. The activities were all great - sailing, snorkelling, Whitehaven Beach. The food was great and the drinks were cold highly recommend!" "The usual compliments don't do this trip justice - It was exceptional, amazing, outstanding! I give it 11/10!" "What a fabulous way to explore the whitsunday passage on board the Whitsunday Getaway luxury catamaran. 4 ensuite cabins only air conditioned, great food, snorkelling, good company and a great skipper Phil and stand in hostess Rachel. There is plenty of food on this trip, BYO own alcohol. The boat is stable and in good condition, visit Whitehaven Beach including walk to lookout, snorkelling in a couple of locations and anchor up in a quite protected bay at night. Very relaxing." "Tremendously enjoyable trip with very friendly crew. With 8 passengers, all of whom chose this cruise because of the small numbers, relaxed atmosphere and flexible itinerary with very good snorkelling â€“ all equipment provided including stinger suits. Highlight was Whitehaven Beach which has to be seen to be believed. Plenty of food." "A really fun trip and made all the better because of the cheerful and informed host and skipper. We have made lots of friends on the trip and will not forget it for a very long time. Cant wait to come back." "A perfect trip! Rich and Veronica were warm, friendly and very knowledgeable about the area. Only 8 passengers is ideal! It was fun and relaxing, we felt as though we were spending the days with good friends. The snorkelling and beach walk were exceptional and the food was wonderful. It is impossible to imagine a better trip except another trip in the near future!" "Our trip on Whitsunday Getaway was the highlight of our trip. After being welcomed on board we sailed off in the comfort of this beautiful catamaran. Days were spent relaxing on the deck, snorkelling and taking in the wonders of the Whitsundays. Evenings spent relaxing on board under the stars. At night as you lay in the cabin the sounds of the seas was very calming. Our hostess prepared the most fabulous food, including snacks each time you returned on board. You could do as much or as little on board as you liked. Overall our time on the Whitsunday Getaway was fabulous & we were all sad when it ended." "Fantastic trip, great hosts, great food, snorkelling + Whitehaven Beach! Thank you so much Phil & Deb for great few days cruising around the beautiful Whitsundays." "Great Experience on Whitsunday Getaways. Will definitely recommend to friends + family travelling to Australia." "Great, thank you so much! !The tour was perfect to get an impression of the Whitsundays and to have a very relaxed time"
"Phil & Deb were really excellent hosts and made the trip most enjoyable. The food exceeded expectations and the sights and snorkelling were fantastic. Thanks to all involved. " "Beautiful boat and crew. Food really good and amazing islands." "Everything was great. Leisurely feel yet plenty of opportunity to do things. Both staff incredible helpful and always lovely , lots of fun. Delicious food plenty of it and always appeared at the perfect moment." "Fantastic experience, thoroughly enjoyed it. Ashleigh extremely helpful with snorkelling, never left my side as I didn't feel confident. I'm so glad I had that experience which I wouldn't have had without Ashleigh's help. Wonderful food, skipper very knowledgeable and extremely helpful pulling me in the boat." The tour had been perfectly organised, the crew was extremely nice and helpful, Food was excellent, all destinations were carefully choosen. Please continue in the way. Thank you fort the trip is was great! " Everything was well organised and welcoming from the minute we arrived at the boat. Deb & Phil were great hosts and we could not have asked for anything more.... except better weather!! Great memories, thank you very much." "Excellent relaxing couple of days, with friendly, hardworking hosts. Fantastic hosts loved the sailing experience and great snorkelling spots. Will recommend! " "The trip was just great. The boat is very comfortable. The crew was nice and helpful. We felt very welcomed. Especially the food was just lovely. It's really fascinating how Deb can prepare that amazing dishes in such a small kitchen :) The snorkelling and the trip to the Whitehaven Beach were lots of fun. Thanks a lot "
"We have had a fantastic time - thank you Phil + Deborah you have both worked hard to give us some lovely memories. Everything from arriving hasn't been too much trouble for you. Skipper, Host, Food & Boat all 10 out of 10! " "Just an amazing trip , made easy by Phil and Deborah! "Great trip! The boat as comfortable and so well maintained. Deb & Phil were great guides and took good care of everyone on-board. I felt very comfortable and able to just relax and enjoy. The food was impressive and I could not be happier with the whole experience would choose the same boat again for a future trip. "Phil & Deb made the trip memorable and have been fantastic. Their patience, hospitality truly encompass the Whitsunday adventure. Debs Cooking and preparation was outstanding coupled with Phil's barbeque skills completed the package. Thanks for a truly great GETAWAY :)"
"Hayley and Matt were great. Both very friendly & helpful throughout the trip. Learned a lot about The Whitsundays whilst traveling which made it interesting. Would HIGHLY recommend it!! Skipper: 10 out of 10 Host: 10 out of 10 Food: 10 out of 10 BOat: 10 out of 10!!!!!" "We unfortunately had lots of rain on the day one & two. But Trent & Hayley definitely kept us all smiling. They were both so informative about any questions we had & were always smiling despite our groans about the weather (would drive one crazy). So thank you both. We have had a ball on our 'minimoon' on the Whitsunday Getaway "
"Crew knew all the good spots on the reef to take us to. We were never rushed. Food appeared 'by magic' at exactly the right time and was healthy and delicious and plenty of it. Was great to have Whitehaven Beach to ourselves thanks to Trent knowing the schedules of the other visiting boats. Trent & Ashley were always attentive but at the same time very relaxed, letting us do what we wanted and allowing us to do as much or as little sailing as we wanted! Exceptional!" "Thorough enjoyed the trip. Felt sea sick at times but it was all part of the experience. Put at ease at all times by the staff. Had a wonderful birthday with champagne and cake , many thanks. " "Overall this was a great trip. Trent and Ashleigh were very accommodating and so knowledgably about the area. It was great to be able to customize our trip a little. My only complaint was the bathroom, the drain did not work so there was water on the floor. The snorkelling was great along with the hike on the last day." "The trip has been such an amazing experience. Even when the weather was bas on the first day, we still had so much fun. The service + attention to details is out of this world. Better than any hotel. Nothing was too much trouble for Trent or Ashleigh and they really made the trip for us both - they are a real credit to the Whitsunday Getaway team. Thanks again for everything. We will definitely be recommending this experience. If you are ever in England give us a shout. " "We loved it! Hard to imagine what would have made it better. Skipper Chey and hostie Claire were fantastic, charming, cheerful, hard working and professional. We loved the places we went to and all the activities. We would definitely recommend this trip to friends." "Crew were friendly and great to hang out with. food was delicious and loved the barrier reef. Weather was perfect, relaxing trip. Even got out work out swatting the marchies!" "Absolutely wonderful. Sail beat all our expectations. Debbie and Phil are lovely hosts who created a relaxed and very enjoyable journey. thanks very much for all the Rickets family. We will always remember this holiday with great fondness. After rushing around this was the perfect getaway great Crew/Capt and other guests are lovely. What an exper3eiice not to be missed, paradise on earth! x x "
"Very attentive & helpful, nothing too much trouble. Thoroughly enjoyed the whole experience. Very knowledgeable and willing to impart knowledge - really good snorkel spots. Very good value for money"
"Very enjoyable and we had a fantastic time. Phil and Deb were very friendly and made our trip very enjoyable. They both worked very hard and made sure we were comfortable and having a good time. Awesome trip - Thank you." "Rachel- Loved it so much! snorkelling was amazing, Trent and Clair both very competent, relaxed, always felt very safe and well fed. Thank you so much Dan- absolutely one of the BEST things I ve done in my life. Trent and Clair are very safety conscious and were excellent. Really sad to be leaving. Thank you "
"Cant Fault it, Trent and Claire are good fun. Trent was so knowledgeable and interesting to listen to. Claire was bubbly and make super food. Will do it again for sure and hopefully talk our friends into coming as well! fantastic!" "Wow! We had an absolutely amazing time. Phil & Deb are great. The food was delicious & surpassed our expectations. The snorkelling sites were great. A wonderful relaxing holiday. " "Absolutely amazing, so happy that we decided to do this, and even more happy we chose this boat. The passengers, food, comfort everything was top notch! Trent and Claire, thank you o much for everything, you re the best!" "Can we come back again week? Crew were brilliant, friendly, relaxing, welcoming and delightful. Beautiful and clean boat, thank you. Great menu, We will tell all our friends." "We loved everything, passengers, staff, boat, places we stoped. Thank you so much it was our best weekend for ever." "Didn't want to go home, such an amazing experience. Such a relaxed and amazing crew, hope to see them again on a return trip, very lucky to have them"
"Our trip was magical, mainly due to the extremely friendly, relaxed, happy and helpful crew. Their flexibility ain allowing us to have a say and create some of the adventure our selves, was much appreciated. Tim and Claire were fab!" "The trip was absolutely fantastic. We loved the boat and were quiet impressed we had so much space in our cabin. Deb & Phil were perfect skipper and hosts and Debs meals were really delicious. We would definitely recommend the Whitsunday Getaway to our friends and family. Everything was perfect, the boat the meals, Whitehaven Beach,the 2 snorkel spots and we were lucky enough to see turtles and huge napoleon fish. Thanks again for Deb & Phil for unforgettable trip. " "AMAZING! Would love to do this trip again and definitely recommend to friends."